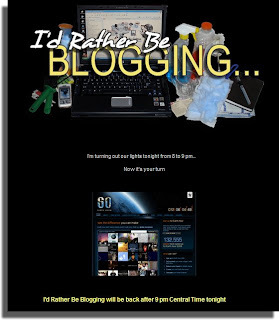 Blatently copying Google's black appearance, I wanted to pass on information about Earth Hour to anyone stopping by, so I created a temporary page that would direct readers to the Earth Hour site. Our own "Lights Out" began early at dinnertime, lighting our candles at 5:30 instead of waiting for 8:00. By 7:00 I was alone, so I turned off the TV and powered down the laptop too... which, for our house, is a rarity. This Saturday night was eerily quiet as I enjoyed my "Time Traveler's Wife" novel by candlelight. With an early Spring storm howling fiercely outside, it was surreal. At 8:30 I grabbed my brass candlestick to peek out the front and back windows; and happily most of the neighbors were dark too. I returned to my chair by the front window and continued reading as the wind buffetted the trees outside and heavy sleet pelted the windows. 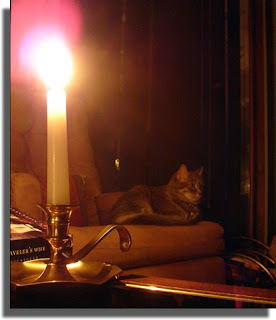 Even the cats and dog found the atmosphere strange, not used to the dark quiet and the flickering of the numerous candles illuminating our dining and living rooms. You know, I don't think I'll wait another whole year to do this again. Whenever possible, I'm turning off the lights, the TV and whatever else, to enjoy a nice quiet evening reading by candlelight. As long as my feline housemates keep from lighting themselves, and the house on fire that is. Good for you, Maureen! Your picture and description of how you participated was beautiful. We did it too, and I agree, it was a nice change. I forgot how nice candlelight can be. oh i knew i was going to forget this.... and last night i saw my neighbor across the street all black and thought it was odd... well at least not everyone forgot! thanks for saving our planet one day at a time! I'm always late to the party. This is the first I've heard of it. I must confess, I had every intention of turning off the lights, TV and computers, but totally forgot while enthralled with the CGI marvels of Transformers! My bad! At least all the lights on in my house are of the CFL variety! Sounds like a great night. We turned the lights out too! BTW - don't you love Time Traveler's Wife? Such a great book. Sounds lovely. We were out at a restaraunt and I didn't think they owners would be too pleased to power down! What is it with cats and open flames? I love candlelight, so i do it every night! We had a very fluffy kitty with a very fluffy tail and she did singe it on a candle one day and I was afraid that she was going to put the house on fire when she ran from the candle to hide under the bed. Ooh, that sounds lovely. I really must re-read that book some time soon - I think it's my favorite. And I'm so glad no one set themselves on fire (lol). Good for you! I'm ashamed to say, we completely missed it. My kids would've thought it was quite an adventure. I think we'll do this tonight (I don't feel like cooking dinner anyway). We turned out all the lights on our set and did the news in the dark (with only two small desk lamps on to see the anchors). It was really cool. I just wished Vegas had participated because the STrip could have saved a lot of energy going dark for one hour. I love candles/fireplaces/etc. We'll have to make sure we buy a house with a fireplace, because I think my wife is getting uneasy about my dragging the BBQ grill inside and burning Duraflames on it. Huckdoll: Thanks. It was fun and educational too. We are trying to be more mindful of stuff we can shut off now. LOL at your hubby, tho. Nell: It was nice... I loved taking photos in candlelight. Scraps n Stuff: Well, you're welcome! I am sure it won't be the last time we'll be doing this. A good excuse for a romantic evening, no? Don Mills Diva: Yes, I am loving the book. I asked for it for Christmas after reading so many blog entries about what a great book it is! DJ: I know! The cats were constantly trying to burn the place down! Casdok: Ooooh. Sounds like a great idea! You must not have cats. Sweet Irene: Poor kitty! Hubby has often told the story of his cats at the farm, trying to keep warm under the wood stove... they would get so hot they were afraid they would light the house on fire! Aimeslee: I know what you mean. 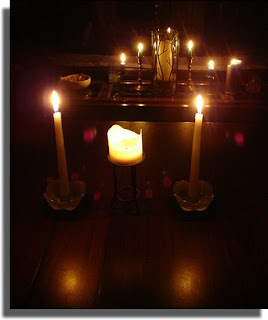 We have had a few times when we were forced to use candlelight, not by choice! Not so much fun, that. Andi: Yes, I can see this book becoming one of my favorites, for sure. Heather: Aw, another poor kitten/fire story! Yikes! Glad she was okay. VP: Wow, sounds like a great news report! The Strip dark; now that would be something to see! And another cat/fire story?? 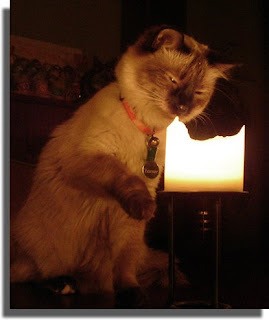 What the heck is it about a flame that mesmorizes cats so? Frogster: Har! Duraflames on the BBQ! I am NOT telling hubby about that one! Although we DO have a fireplace; something I insisted on too after having our first home (a side by side) that had one. I love it. And it's been known to keep us warm when our furnace gave up the ghost. It's a real wood burning one too... not the fake push button kind.... good luck with the indoor barbequing! Love the pics, and kudos to you for reducing your carbon footprints! awwwwww your kitties are so adorable. WTG and congrats on participating. I completely missed it but I try to always be aware of our electrical use.